In myth one parentage given of Apollon, the prevalent one of the Theogony of Hesoid, tells us that the legacy of Apollon is established by his grandsire Koios, just as much as the legacy of Zeus is constructed and part of the nature of Kronos. Koios is the heavenly axis, the pole of the heavens, that when Ouranos (the heavens) was pinned by his sons that each took a corner but Koios grasped him in the center while Kronos with a scythe removed the testacles of their father that caused their mother Ge/Gaia such grief of breeding offspring that Ouranos would not permit to escape her holy womb. Koios is the axis, the north star of the heavens, the great eye of the heavenly dragon which may or may not have relation to an alternate parentage of Apollon as son of Corybas who was transformed into a dragon. Apollon himself manifests, like Zeus with Cronos, as heir of Koios through his mother Leto. His very own most sacred image found at every home was that of a tall upright (usually black, but I am uncertain if it was of a natural pigmentation of stone or if it was coated with substance to give it a black appearance) where Apollon was worshiped. Where temples adored Apollon in various forms, his most ancient and common household form continued to be the simple stone where he bestowed his protection upon the household and where he received daily and monthly offerings and offering of any auspicious occasion, poured over his form and garlands draped from this simple aniconic form. While there have been plaques and other simple images to of the god, the common appearance of the god as a stone through Hellas and into Rome and throughout Europe by Rome, has to be the most universal and most worshiped and beloved form of the god. It is the god without containment into true form, he who is formless and ancient. He who delights in the pouring streams and fountains with which a number of them are sacred to them, he who is the uplifting column of light illuminating all things, he who is the pole around which all of the heavens and the turn of seasons and years turns O lord of time who is both as the sun and the beauty of the moon, he who is the kithara player—and as such the leader of the holy dance of time as each song he plays summons for the seasons in their ageless dances. This is both his generative form and his destructive form this manner. He is both as the erect spear (and the miniature form as arrows) that his very column like form bears at Amyclaeus, the column of fire uplifting, the column of life bringing forth generation for which people may imagine that it is has a slight phallic resemblance even though it is not phallus. This simple form, the healing lord of the springs, the fiery destroyer/protector, the generator and protector of young, the upright leader of the dance and pole of the turning heavens, in this form he is all these things at once and more. There has too been some argument that the doorway offerings to Hekate or Artemis Prothyria may have been offered in the base of the lingam as to which in Rome it makes sense especially to see a youth and maiden on a temple plague attending both on the adornment of the Agyieus stone. Although we do not find any direct reference to either of these goddesses with the base of the Agyieus of Apollon, although perhaps a vague reference to Hekate and two great pillars (Hermes and Apollon Agyeius respectively) it is easy to see how these goddesses can be so associated. 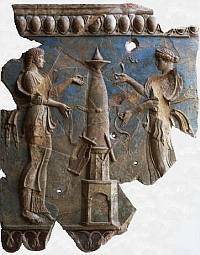 Especially when we see imagery of Artemis as pouring offering to the bowl of her twin and their inseperable union with each other. Understanding the stone as a column of light and Artemis as a torch bearer, that which bears the light, is perhaps a very significant metaphor for the imagery of the stone secured. In the Hindu narrative likewise we find Siva, the lord of the column of which is his true form, and of which Brahma and Vishnu competed to scale its great height to remove a flower from the top, a top that is infinite and unreachable except to those that by grace he allows. Although, like Apollon in Hellas, Siva has many beautiful images throughout India, we still find the most common and sacred is the formless god as the lingam. Large beautiful lingams grace the temples transfixed and unmoveable, and small ones in the households blessing the householder and wife, blessing the children. He to dwells inseparable from his union with Sakti/Parvati. It is to this form that his offerings are provided, ghee, water poured, honey, milk. Garlands of rudraska beads and flowers adorn his form. His blessing pour forth, O great column and lord of time. At his winter festival we find this form symbolically replicated as its true form as a column of light of which the stone form is but a stable permanent reflection. At this festival a great bon fire is created which spires to the heavens. Videos can be found online of this and it is an awe inspiring sight to behold this great shift of light connection the heavens and earth. Massive and uncontainable, without beginning or end. The upright column is continuous without limit. And so my lingam/Agyieus stone is to me the most beautiful image of my god. My lord Siv-Apollon free form limitation, ever dancing, ever churning, rotating forth all things, from who the coolest blessed water gush forth by his headed is rooted in the heavens even as the hottest of fires of illumination emanate from him at every point as arrows shooting from him. Siv-Apollon is greatest of archers, shooting forth the greatest distances from afar, he is both motionless and in motion, he is leading forth the motion of all life and living beings, of beasts and men, and reuniting them again. Most blessed lord, I will ever give most devout reverence to this form of yours O Siv-Apollon! I will dress you with flowers, and pour offerings to run upon you for your delight, perfume you with sweet smoke of incense. You are the door to all things blessed lord and with adoration will always bow before you! The white cloth that is dressed upon the god, the pure white fillets, the white threads. these please the god Siv-Apollon. I have addressed the sacredness of the color white before as being a unblemished color and color of purity as we generally recognize it, a heavenly color preferred for sacrifices to the Olympians as the best, but also a color which the ancient Hellenes recognized as being the color of light itself, that which contains all other colors within it that is revealed only through the action of a prism causing refractions. The sacredness of white suggests not only that it carries all things within it, but that through its division we get multiplicity, in which sense of Saivites it makes perfect sense that white is the color of Siva. Not only that color which he is adorned with but also which is ascribed to him as a god who is white is the jasmine flower (this aside from other less common manifestations where Siva presents himself as red or black). Saivites recognize Siva as being the ultimate reality, through which all things are divided and even as he divides from himself, he is the destroyer of separation and multiplicity, of the illusion of separateness. In Neo-Platonism the function of Logos is very much similar, and by which we find Apollon, even if not stressed as the supreme reality (although some Neo-Platonism does seem to hold a unity of Zeus-Apollon-Dionysos as the ultimate divine being) operating as that which through truth brings unity with God. Here we see regardless of philosophy of what god is a the highest point a similar purpose of Siv-Apollon echoed multi-culturally, that which is expressed in Sanatana Dharma has the great or foremost guru. Even in Vaishanavism we find Siva still in those role even when he is considered a lesser manifestation of Vishnu rather than the supreme reality as in Saivism. In either case we find Siv-Apollon as the god of the law of freedom who destroys the separation between god and men, as Apollon is expressed in Orphism. I have been giving serious consideration of adorning myself with white. While I may not dress entirely white (because that just spells a disaster when you have a toddler and because I can’t seem to resist spilling something on myself at some point in the day), I am thinking quite seriously of ropes of white shell or stone beads. Hail to you O lord. Jai Siva, Khaire Apollon. Hail Siv-Apollon! Apollon came to land in the cradle of Mt Parnassos, and there he set up his temple. The first temple of myth was made from cuttings of laurel branches, the second incarnation of the temple of beeswax and feathers that was said to have been born away to Hyperborea by a wind, the third of Bronze which was said to have been swallowed by the earth. Two more temples are attributed to Apollon of human construction. Yet Apollon set the foundation of his own temple, and in doing so it said in myth that he came into confrontation with the dragoness Delphyne. The Homeric hymn stated that she was a bane to herds, a predatory creature, thus as the nature of the dragon. Yet Apollon is named Delphinios that is not only related to the dolphin in the form of which that he brought his priests to Delphi (although ancient images of dolphins look a bit sea-dragonish to me) but also likely to Delphyne as much as he is called Pythios after the rotting action that he inflicted on her for which she is called Python. This is an important feature as whenever we have shared epithets between Apollon and Artemis it is due to obvious clear shared features playing off of each other. We see this is terms of Daphneios and Daphnaea in which they are both of the laurel, in Kitharados and Kitharadia (warning I always butcher the spelling here for some reason) in which both are players of the kithara, with Artemis we see this particularly in Sparta), Lykeios and Lykeia, Hyakinthios and Hyakinthia (where Artemis is portrayed bearded), and a host of many other names..including Delphinios and Delphinia, and Phoebus and Phoebe which are of a particular feminine root mythically rather than the usual masculine mythical root in their shared epithets. While Artemis and Apollon share a relationship through their maternal heritage with Phoebe, Leto’s mother, it is quite probably that Apollon is called this more in relation to his twin who would be considered the heir of Phoebe as much as Apollon appears to be as a heir of Koios (in the hymn to Apollon by Kallimachus this seems most apparent as the implements of Apollon are hung on the great pillar representing the pole of Koios which may also have a link to one reason why Apollon is represented aniconically is an erect upright stone). In this sense we see why Apollon is called Phoebus, and why Phoebe is said to have given to Apollon as a birthday gift. Do we mean Phoebe as in the maternal grandmother of Apollon or Phoebe as in Artemis who proceeds Apollon in birth. 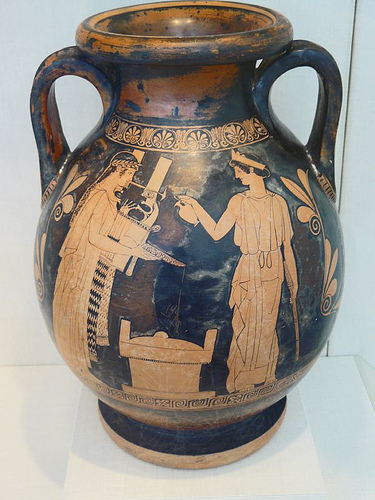 The connection between the former Phoebe and Delphi has been strongly related to the connection of Phoebe and Koios as a pair of the axis. Phoebe at Delphi at the axis of the earth of the dragon Delphyne, and Koios at the axis of the heavens with the great heavenly dragon which the polar star represents the eye of such dragon. Phoebe and Koios then can themselves be seen as great guardian dragons of the axis themselves, which would go a long way to demonstrate the importance of serpents in the cult of Apollon and Artemis, as well as the naga-like representation of Delphyne. The association with Artemis directly with Phoebe (descent from her in myth) implies that Artemis Phoebe could be very well seen mystically as the slaying of the huntress (the allegory of the hunter turned into game is prominent in her own myth via the myth of Actaeon who in one version is a suitor of Semele and in another myth seeks to be a suitor of Artemis). The hunter prey dicthotomy is very strong in the cult of Apollon and Artemis. Artemis who is Lykeia is the goddess of the hunt and of the hunting dogs that would be trained to attack wolves, and Apollon Lykeios who is at once wolfish and slayer of wolves. This may be somewhat behind Plutarch’s analysis of Apollon and Dionysos at Delphi as a singular god in which Apollon represents that form of the god which is destroying of the self. But I digress. The tears and grief of Apollon and his self imposed exile otherwise is way over the top if it was nothing more than a dragon that he killed. So would be the elaborate funerary customs of Apollon libating to the Python if she was not symbolically linked to Artemis. Certainly other versions attest to the twins killing the dragon together but this is more likely a variation playing on the confusion of two different Pythons of Delphi, Delphyne and the son of Gaia, Tityos, who was slain by Apollon and Artemis for his attack on Leto and for whose death would account for their joint departure for purification intended at Crete but without exile. This confusion between the two myths brings Artemis more actively into the Delphyne myth cycle where she is otherwise not clearly present. This may very be intentional as a way to indicate to the mystical nature represented in the allegory of the slaying of the dragoness. This would also be pertinent to the symbolism of the amber tears of Apollon. The only other myth of Amber that we really find is in regarding to the Heliades, the daughters of Helios and sisters of Phaethon who became poplar trees that wept tears of Amber for the death of their brother. I was asked a short while back to discuss the connection between the death of Phaethon (whose name means shining) and the death of Python, aside from the similarities in their names. Here we find Phaethon representing a disruption in nature, he drives the sun chariot out of balance creating chaos and catastrophe on earth, and is slain by Zeus in order to correct the balance. Even though we do not find these tears being shed by Helios, but rather by his daughters in his place perhaps, it is linked to the sacrifices necessary for the harmony and balance of nature. Death is a necessary process but memory is eternal even as amber is a somewhat permanent transformed form of organic sap. Death is transformative, and so the myth of Phaethon demonstrates this clearly with the transformation of his sisters, and the eternal amber, a substance closely associated with other earth deities perhaps in a chthonic association. Similarly we find in the slaying of Delphyne a keeping of balance. Predators are necessary, but predators have their own predators and nature corrects over populations of predators to prey resources. Malevolence, regardless of anything suggestion of it that may be attached in the course of story-telling portion of the myth, is not a factor. Nor is it a factor of good versus evil, or of god versus goddess as is popular among goddess-spiritualist retellngs of the myth. Rather it is a grief over the necessary of sacrifice, the fruit of destruction, and the cycles of life and death that are so much part of Apollon’s cult (and in a manner Helios cult as well). Delphyne remains as a benevolent daemon at Delphi under the guise of Python and her representations around the omphalos, and the celebration of her sacrifice at the end of each divine year, and Apollon’s grief for slaying that which is representative of his other half, his twin Artemis, and the taking of the name Pythia by his oracle brides. The close relationship between life/light (which we see in Phoebus and Phaeton’s names) and Pythios/Python is something that contains symbolic weight of the balance of life and death. Although carrying mythic differences, the association of Apollon’s tears over Delphyne is remarkably similar to the rudraska tears of Rudra upon the death of Sati/Shakti. In myth Sati immolated herself, who had already been grieving for her separation from Rudra/Siva and then suffered insult and non-presence in the company of her father (who neither acknowledged her presence in either her literal presence or even her presence via her connection her husband by refusing offer Prasad to Rudra/Siva. This sense of separation is being out of harmony in my view, a sense of imbalance or a state needing correction. At her death Siva brought forth destruction, calmed only by Visnu dividing the body of Sati (thus the body wasted away like we find with the myth of Delphyne) as Siva wept tears that became the rudraska that is most holy. Siva afterwards paid penance by retreating into the mountains of the Himalayas, a self imposed exile which led to unity again with Sati when she came again as Parvati. Separation unity, life and death, harmony and balance that is all one. The amber tears of Apollon carry the full of the weight of the mystery of Delphyne and carry an honored status in my view that is not dissimilar to the rudraska, and I know many devotees of Apollon who wear amber for him or find amber to be a highly important devotional item in his worship. To this ends I plan on, in my own personal worship with the unified shrine of Apollon, Siva, Parvati and Artemis, to string the rudraska beads (from a strand my baby broke) with amber beads to wear during worship to so honor this one sameness element. I have written before regarding Apollon and Siva, but as I am continuing my studies with Saivism this has been becoming more profound in insights I have gained. The cultural Hellenic understanding of Apollon is beautiful and profound in itself, yet when I see him through Siva, my understanding gains new depths of himself in a greater form that is beyond cultural understandings of the god in all his forms. The most striking moment for me as of yet is when I was reading Dancing with Siva and I came to the portion on the symbolism of Siva’s dance. Apollon as a divine musician and dancing god in his own nature, the lord of the weaving Crane Dance of Theseus at Delos, the excerpt on the dancing form of Siva shows itself to be the most relatable for a worshipper of Apollon when it is broken down. Perhaps the only lack of real clarity is the drum of Siva. This is because as far as I have seen, drums were not significantly important to worship of Apollon. In some ways I can see where some folks would see Siva as containing both Apollon and Dionysos within him, as drums were significant in the worship of Dionysos, as well as in the worship of Rhea/Cybele from whom he likely inherited the drum. It is unfortunate that we do not know more about the Apollon of Crete, or really very thorough information of the Doric Apollon (as it is believed that the Doric people brought his cult to Crete) as there may be significant thing to this father of the Korybantes, this son of Korybas, that was not commonly shared through other parts of Hellas. What is apparent is that despite the lack of the drum, the harmonic vibrations of Apollon’s domain serves much similar purpose as the drum operates….provision of rhythmic order….this in itself can represent the issuing forth of creation as the drum of Siva represents. That creation itself is an act of order from chaos as we find in the illumination of Phanes who divides the substances that creation is born in the cosmic egg. This brings me greater understanding here in which my lord, who is lord of the axis, is central dance of harmony and order. A lord of the gateway through which life passes into new life….an ever renewing cycle. For as the drum, or rather the vibrations of lord of Apollon which is more commonly represented as the lyre, reminds us that as he is directs harmony, nothing ends or stops. Everything is always in motion. Energy doesn’t just die and disappear. It continues on its movement, transforming and changing, but unceasing. Apollon as lord of the tomb doesn’t represent then end, for the lord of harmonic movement there can be no true end. It is just a series of death and life. He turns all the seasons around as the Orphic Hymn says. The lower right hand of Siva is raised in blessing, bringing preservation. Apollon is the preserver and protector. Not only of humanity in general as we have seen on many accounts, but also more commonly of children for which he is honored following safe birth after they survived 7 days, even as he is honored at the release of the soul on death for a period as it releases its bonds until the soul is escorted from the earth by Hermes. As Apollon is connected with agriculture and herding, we know that he is closely associated among the living with the preservation of humanity through the civilized arts. He is the ripener of crops preparing for harvest, and the rearer of beasts to feed men. His blessings, even as his nature is as a destroying god, is the blessing of nurturer and preservation until the moment which life is ready to be plucked. The preservation of life serves purpose, but even still it is a blessing and gift to us. On a more symbolic level, preservation also serves when we look at the god as oracle announcing religious and spiritual obligations, the will of the gods…..or even the institution of education and the arts which feed the soul in its development. Part of his preserving grace is illumination of the path of progress to apotheosis. This is perhaps one of the greatest symbols of the throne of Apollon resting on the tomb of Hyakinthios. Not merely out of love and affection but also an indication of the grace of Apollon by which our ends are accomplished. This would certainly make sense why scenes of certain mythic victories (such as Theseus over the Minotaur) was inscribed on the throne. The throne lies upon the tomb, exactly completely measure over the process of life into the apotheosis and liberation of the soul. The upper left hand of Siva holds a flame, which is destruction and dissolution of form. This is the balance to the drum. This is Apollon as the destroyer of which we know him. He who is the law within nature which renders all things into dissolution. Apollon as Pythios, the god of rot. Apollon as lord of the tomb in which the form decays and releases the soul within (or more anciently with funeral pyres was probably lord of the pyre with the devouring flames before burials became more common). He destroys form, with his serpent arrows (which were likely envisioned as fiery arrows by this description…fiery and venomous). Unlike ideas that Apollon’s association with the sun were by his arrows significant of light, this is not the case so much I think. Apollon when he has provided illumination he merely holds aloft his bow and light issued from it. Now his arrows are destructive fire, which is also possessed by the sun by which association here may be based. The position of the legs of Siva Nataraga as described by Satguru Sivaya Subrahmuniyaswami is perhaps the most relative as his role as gatekeeper, god of the boundaries. For one foot is placed upon an earthbound spirit confused by its sloth (or unevolved soul) while the lifted foot is promise of liberation. If the processes of life and death are a symbol for the journey of the soul then we can see the liberation of destruction of form itself and the release of the soul is also a symbol of the progression of the soul into apotheosis, into unity with the gods rather than trapped in the human cycle. Apollon as the charioteer has a direct link to the chariots of the soul described by Plato in which each soul has a chariot which attempts to rise to be near the god it adores, but undisciplined, without spiritual progression, they cannot sustain nearness and are ever falling. Close to the earth are great masses of soul chariots. I have long said that the contests of Apollon and the liberation by destruction (the myth of Marsyas in perhaps a rather important one that combines both of these themes) are ways of explaining Apollon as the gatekeeper. As I said above he is enthroned upon the very process of apotheosis, which indicates that he is the god of the gateway of apotheosis which only souls can pass which are proven. Apollon being enthroned on the tomb of Hyakinthios serves purpose similar to the gesturing to the upraised foot by Siva Nataraja with his lower left hand. I am just touching the very utmost tip of Saivism but so for it has been very profound for me. So I have vastly amused myself reading a particular article online for another post on more syncretic fun (since I rarely post on this it is nice to indulge). Foremost because this article that I am reading, which compares Faunus/Silvanus with Rudra/Shiva ends his essay, after mentioning a great number of things that fit quite well with Apollon but as assigned to Faunus, by saying that connections to Apollon are superficial based on healing, destructive nature and possessing a bow. So this is the characterization of Apollon. It is so *nice* when someone puts a lot of effort and thought into their article regarding one god to address another god and sum them up in one sentence. Not that I disparage the association between Faunus and Rudra, but rather I think Faunus is the key in those pieces of academia that associate Apollon and Mars, the latter who was intimately associated with Faunus and Silenus. Of course it is easy to forgive it away and say well this individual, clearly a student of Roman religion, either has less developed information on Apollon, or choses to ignore it. First I would like to give a snippet from a book on sacred-texts that was drawing quotes from Vedic literature. First of all there is nothing in this that doesn’t sound like Apollon. In fact one etymological source that connects an indo-eruopean root for the name Apollon comes from apel, which means strong. This is nothing new to those who are quite familiar with this god, as Apollon is a god who not only outraced Hermes but also outboxed Ares. Apollon is all in all the victorious god. I saw another website which poo-pooed this etymology as saying that they couldn’t see how apel became Apollon, except that in Dorian dialect the gods name was Apellon. Intelligence really should be a-given considering that he is the leaders of the Muses, daughters of Mnemosyne (Memory) and as a bringer of civilization that would be linked all cognitive arts and abilities. Though the author of the article I will get to momentarily downplayed the healing and medicine of Apollon, but this is clearly a big part of Rudra’s character whether that author wanted to admit it or not…healing and reverse dealing with disease and death to all manner of life. As we know from the Iliad Apollon’s arrows effects all life, starting with the beasts and continuing on to men. Apollon’s association with cattle I have spoken of before, and is quite apparent to in the Homeric Hymn to Hermes. Likewise the lost satyr play Sophocles deals with this very myth, which takes an interesting form as Silenus and satyrs aid Apollon in the search. Apollon is notably brilliant as the sun, so much so that he is confused with Helios frequently, and he is quite golden…his hair is literally gold in what remains of the statue still preserved at Delphi. And lord of songs is a no-brainer I would hope. As for sacrifices, Apollon on a Hittite altar, supposedly constructed during an allegiance with Alexander the great, called Apollon protector of the altar. Here he is in the position of protecting and supervising sacrifice activity. Even in his oracle position this can be known as he often indicates to petitioners on how best to sacrifice to a deity, or what sacrifice is necessary. Apollon does have one epithet though that refers to god of sacrifices, specifically of sacrifices following disembarkment, and an epithet which calls him lord of ashes may have something to do with the sacrificial ash altar as much as it does with his association with the funeral pyre. This may be a bit of a stretch I admit, but it is there nonetheless. Even bountiful is well present considering that Apollon is associated with the bounty of grains, the maturation of which is intimately connected to important festivals of his, and the grape harvest at summer’s end, as well as simultaneously the shepherd sacrifice in which a ram reared through the year was sacrificed to him at the aforementioned Karneia. Because he is part of the seasonal maturation and harvest process he is a bringer of bounty. Likewise, the reference of him being the ruddy boar can be found in Apollon’s association with pigs and boars that I wrote of previously in other posts which you can find in doing a quick search of my blog. Last the Maruts which are connected with Rudra, as their father here are important parallel as Apollon Telchines was associated directly with storms, and as I will go on to mention from the article the Maruts played as singers similar to the Corybantes and the choruses lead by Apollon in the mysteries and in regards to his relationship with Dionysos (who bears a strong resemblance to Indra in many respects). So now I want to address the article, having taken care of that quote regarding Rudra. I will be quoting paragraphs that the author used as evidence for his claim and then cross reference this with what we know about Apollon. Frankly, as I have mentioned before in other posts, despite Apollon’s characteristic alignment with civilizations and its gifts, he is more typically a loner. He is a god who dwells in the high mountains, and a good number of his temples are in such locations, including at Cyprus where his temple resided at a higher elevation. If not in mountains, they were often distinctly outside of the city limits. The original temple of Apollon at Athens for instance was in a swamp, and another important temple resided outside of the city on route to Eleusis. Pausanias mentions many temples of Apollon that reside outside of the city proper in fact. But moreover Apollon is a god who roams Parnassos with the Muses, which mythically is how he first came upon Dionysos who was traveling there. This doesn’t seem to fall short of another quote given by the Vedas which says “Shine upon us, dweller in the mountain, with that blessed body of thine which is auspicious.” Most of these points I addressed above, but I want to emphasize that Apollon has big time military associations. In the Peloponnese he was particularly revered by the Doric people (especially the Spartans) as the went into battle. He is the Marshaller of the Host, and the Paian was sung in Hellas at facing battle of which we have account in Aeschylus’ The Persians as being such a sound that it invoked terror. It is rather likely that a number of paians composed for Apollon were of a militaristic character (especially given that Delphian myth in which he was called Paian being told to strike!) as often as they were associated with healing mythically with the tale of Hyakinthos in the Spartan myth. Also, never mind the clear militaristic nature of Apollon in his defense of the citadel of Troy in the Iliad. As I mentioned above Apollon is also called the father of the Corybantes in Somathrake. The Corybantes which militaristic dancers and chorus that were an important part of the mysteries. Apollon as their father was quite probably their leader. In relation, Diodorus Siculus when speaking of Apollon and Dionysos on the latter’s campaigns, says that Apollon accompanied him as the leader of the choruses of the army. Consider this then given what I have said above, and what many of my readers are probably already familiar with from previous posts. The relationship he is stressing here between Faunus and Silvanus is quite similar in many ways to the relationship we see between Apollon and Pan, both wolfish deities, but shepherd gods, both depicted as horned gods (the horns of the Doric Apollon could be that of a ram or due to recent research could more closely resemble a large breed of goat particular to Crete),and both pastoral gods called Nomios. The division between urban and rural is a bit more blurry as both gods have residences within and outside of cities. The Doric Apollon is also in at least one place called the son of Silenus who probably more closely resembles one’s idea of Faunus of the Romans. So this association that the author tries to jump into is one that equally fits with Apollon despite his declarations at the end of his article. The author then goes to some length to go into the Etymology of the name of Faunus and Silvanus preparing for an etymological journey into the name of Rudra. Unfortunately as this doesn’t fit what he desires, as he rejects the association of the name Faunus with wolf, he draws on another resource in which the rud root can be linked to an earlier Indo-European meaning wild or rude. Personally I have no problems with the first interpretation as Lykeios does refer to the wolf, and that as the wolf he killed the Telchines (and thus perhaps alluding the howling winds as Apollon is known as a storm god as Telchinios). Even roar as the Hittite version of Apollon’s name means “Father Lion.” Apollon is intimately associated with sound in general…fierce and beautiful both. And there is more than one myth in which the weeping of the god has produced result. The tears of Apollon in his exile as he flew off to Hyperborea has been noted as becoming amber that fell to the earth, and the creation of the river of Marsyas is attributed to the tears of the god and the nymphs, giving new body to the slain silenos from whom all satyrs sprung. If we consider the possibility that Marsyas may very well be Silenus, and Silenus may have been a form of Apollon in his pastoral nature, in which his older form was slain (much in the way the association is made between Medusa and Athena has been made), then we can see an interesting context in alignment from the text the first quote came from in which the weeping was a transformative tool from Agni (who there is one idea that connects this name as an etymological root of Apollon via Andrew Lang his book Modern Mythology, actually from a name of Agni as Saparagenya) to Rudra. But back to the article in question. 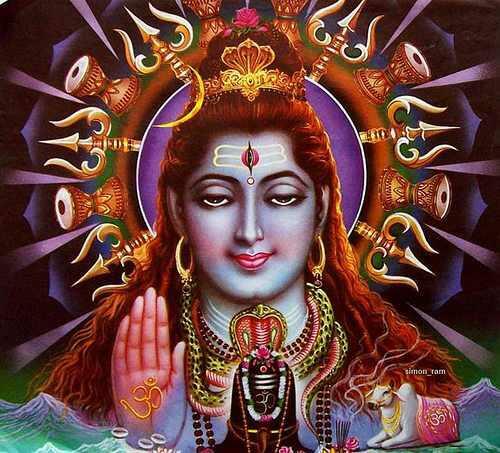 He says that Rudra is called Shiva that he be favorable. Though there is no name for Apollon that means favorable, whereas Faunus does have this attributed to him, Apollon’s name in one translation is of a favorable nature in that he wards off and has many epithets that address him as a kind of benevolent rescuer, protector, helper and so forth. The author then goes into speaking of cattle. As I have said above, Apollon has a strong connection with cattle, from the skull of the bull he had in Claria, to the bronze ox, bull and bison that were left as devotional gifts to him at Delphi, and the Homeric Hymn. Apollon is the god of the ox-goad, and though he “trades” it in myth to Hermes, it is as much as his and Hermes continues to own and use the lyre and gift it to his favorites. Apollon is perhaps in his highest function as the divine shepherd. Just as his son Ascheylus becomes associated with his healing functions, and his son Arisatios become association with his herding functions. But above all this is Apollon’s domain. He ushers in new life, he nurtures it, he rears it to maturity, and he slays it. It is of little wonder that when he had to serve penance it was acting as a shepherd, both in the case of Admetus and for Ilium which is referred to by Homer in the Iliad. Shortly afterward the author then carries over to discuss the wild nature of Rudra, perhaps to shore up his connection with Faunus, but what he uses as evidence speaks more to be of Apollon who lives beyond the Ripaean Mountains, in the North beyond the North Wind… Apollon who delights in mountains as I have indicated above. the aggressive nature of Apollon, that can be perceived as fearful, is well known to any who have read the Iliad or any number of Apollon’s myths in which he slays the living. The author makes an attempt to parallel this with Faunus and Silvanus in more specific kinds of dangers that they manifest, but doesn’t to me come across quite as broad as the all-slaying darts of Apollon that inflict man and beasts (again as we know from the Iliad) as well as several epithets in which he is a slayer of specific kind of creatures. This is followed at length by discussing the fertility and healing nature. this pretty much follows on my previous comment. Apollon is the divine shepherd, and as such he does it above and beyond. When he kept the herds of Admetus every ewe and heifer dropped twins, and so rich became the lands of Ademtus from this. His associations with fertility and shepherding can also be connected with the mystery program of Demeter in which Apollon is not only a swine-herd, and leader of the chorus/initiates, but also propitiated with offerings during the Proerosia in the autumn suggesting a fertility association in the autumnal harvests before the rainy season of sowing crops. There is also something I had read not too long ago, I want to say from Proclus but I can’t be sure, maybe one of the Rhapsodies, in which Demeter is addressing her daughter in regards to the bed of Apollon. This is specifically called into association with Rudra via a commeration of the dead. Though, I don’t know of any commemoration of the dead in Hellas around this time, the associations of harvest and the sowing season, and the descent of Persephone do have a certain address to this idea of the death of the season beginning of the planting season and thus requests addressed for fertility, even though Apollon shortly thereafter departs again for his most northern abode. “You are medicine: medicine for the cattle, medicine for horse and man, prosperity to the ram and mother sheep”. Of course the author makes a point of comparing he aggression of Rudra as more of a natural aggression rather than that of a warrior. He states it along the lines of being like a dread beast of the forest. This makes no nevermind to me though as wolfish Apollon says much the same. Likewise for all his actions in war, Apollon himself rarely appears as a true warrior, and certainly nothing really like Ares and his martial exploits. Aside from Marshaller of the Host, there is no title that refers to Apollon as a warrior, though like his twin he is called “hunter”. So whether the case is being made for an association with Faunus or with Apollon this idea resonates well with what the author is pointing out here. And the Iliad while it shows that Apollon is an effective warrior the way he relates to war is quite different. This is then followed by paragraphs that address associations of Faunus with prophecy, poetry, singing (particularly military singing), and victorious singing…all of which is similarly part of the domain of Apollon, and by extension his Corybantes. The point is that I don’t disagree with the author of the similarities expressed here, however I do reject the following statement due to the sheer ignorance with which Apollon is treated here, especially given that I consider Faunus to be the bridge that really gives a considerable link between Apollon and Mars in that some academia has explored, and to be of greater relationship to Apollon than any other Roman deity to be quite frank. Therefore I find this final line to entirely miss a large part of Apollon’s functions in his domain and as visible from his cult worship and myth. Faunus does match well, but so does Apollon and in several cases he appears to match better. I had this question posed to me in regards to my post about my syncretic worship of Apollon and Shiva in which I was asked that if I was worshiping at separate shrines how this made it syncretic and not just worshiping Apollon and Shiva as separate gods (my paraphrase). The first thing that came to my mind was, what does how it may appear to casual observer looking at my altars signify in my relationship with this god, or how I interpret their syncretism, or internally understand this god? That really made no sense to me because a lot of what we do religiously is not external but rather internal. 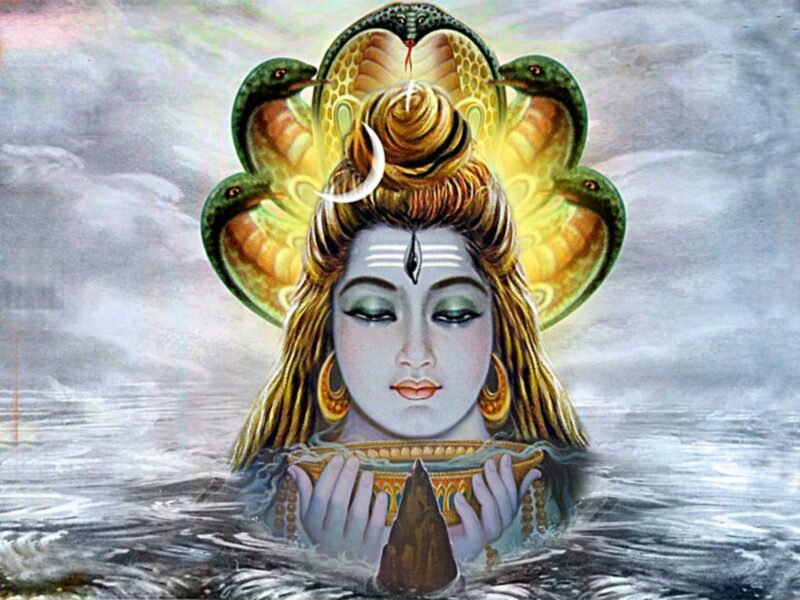 There are external clues so to speak…like if you hear me playing mantras to Shiva while I am praying to Apollon and occasionally burning some of the Shiva incense for him…that may be a slight external clue. Also when in prayers at the altar for Apollon I call him Shiva in the prayer, and same at the altar of Shiva I have addressed him at times as Apollon there…well there would be more external clues. And perhaps these are things that I should have put into my first post to give a better idea of my syncretic worship of this god. But really the thing that drew my attention the most is, why shouldn’t there be separate shrines? I have multiple shrines for Apollon in my household. The main altar by the doorway in the living room which is the main household altar for Apollon, and a smaller shrine to Apollon Lykeios on my bedroom desk. On my bedroom dresser meanwhile is my shrine to Shiva. Having multiple shrines doesn’t mean that I consider each of these as separate gods in my household…but rather having three shrines that do specific things. The main one in the living room is for prayers to protect the oikos as well as general offerings to the god, especially as Agyieus, and particularly on his sacred days. The smaller shrine to Lykeios in my bedroom is for praying at when I rise and before bed. The shrine for Shiva is where I pour offerings at the shivalinga. Each shrine has been developed a certain focus. And that is how I regard them, as very specific foci rather than a huge monster of a shrine to do everything. Perhaps this is confusing, especially for folks who only have one shrine per deity in their household. But for me it makes perfect sense…and it is not uncommon in Hellenismos especially when historically you would have altars to specific epithets of a god within feet of each other. Sometimes it is more serviceable to have more than one shrine….and even more so when you are dealing different cultural formulas of worship. Though I have a page on my blog devoted to the syncretism of Apollon and Shiva, I noticed that I have never addressed on my blog how this plays out in my life. This is keeping in mind that my worship of Shiva and Paravati is something that has only been slowly seeping in over the last several months. Albeit I have been feeling a nudge to explore in that direction for a while. I have always felt it was a bit strange that I never felt entirely compelled to explore his Khemetic syncretism, nor those of other cultures. After all, the subject of *where* Apollon came from into Hellenic worship has always been a subject of fascination in scholarly works, and you have hypothesis of varying kinds which attribute his origins to Egypt, to near Asia, and even to the North in accordance to his mythical genealogy connecting him to Hyperborea. But for some reason syncretism just didn’t seem like that important of a topic to get all tangled in. So it seemed almost a “rude” disturbance to find oneself being thrust with a compellation to learn about Shiva. It wasn’t a conscious decision on my part, but rather more of nagging impulse in the back of my mind. This gave rise to research, and the development of my syncretism of Apollon and Shiva, and of Artemis with Paravati/Kali as I speak of on the page linked at the top of this blog. I have found though that being a syncretic isn’t as problematic as I thought it would be. It is essentially a process of training myself in two, though revealing themselves to be more and more closely related, religious traditions. 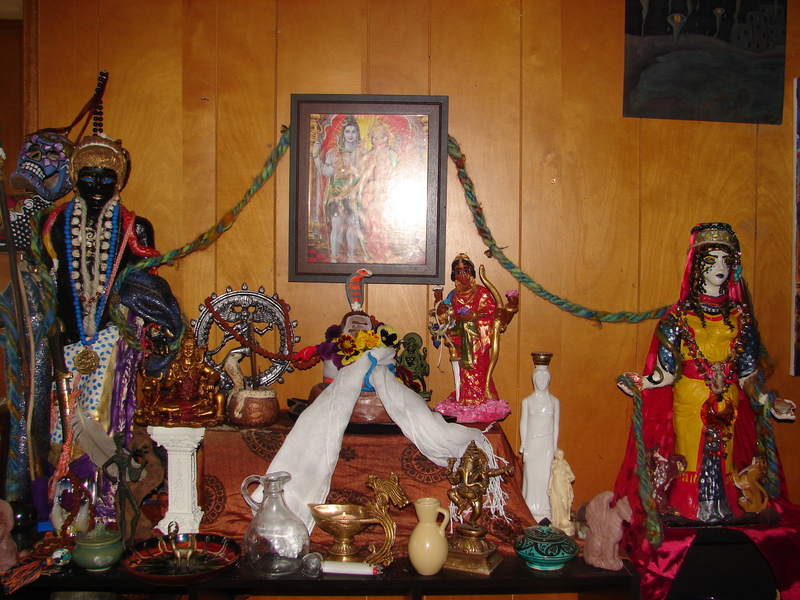 But in doing so I have found that the best method is to not blend their imagery together into one massive altar, but to have multiple altars through the household. Thus I offer Hellenic prayers and libations to Apollon and have begun doing appropriate Hindu prayers (though simple at this point) and offerings to Shiva. It almost seems redundant is some ways, especially with the offering over the black agyieus stone for Apollon, and the offering over the shivalinga for Shiva, but I have found this an enjoyable and reasonable way to practice my syncretism. Even the incenses I use for these altars are so similar that they rise in a perfect sweet blend. As I pray to Shiva who dances the passage of time, I honor Apollon who with his lyre played to his stepping dance issues the passage of seasons. And as I offer to Helios at the altar of Apollon at the doorway, so too before my prayer to Shiva I make offering to Surya in the morning. I have found it to be a spiritually harmonic religious lifestyle, that brings me great peace and contentment. It brings me joy recognizing this other form, elder form in most probability, of my god whom Arkadians called among the first of the gods. Hail to you sweetly perfumed king, you who delight in high mountains, pouring out over the world your endless light, lord of truth, king destroyer, turner of time.